With PRYDE Yasaka introduces the first POWER TENSION rubber. PRYDE offers a quick ball bounce, nice sound and a rubber surface with improved friction. 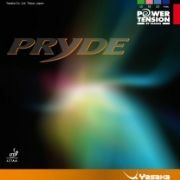 PRYDE is suitable for advanced players.